BURBANK, Calif., May 23, 2018 — (PRNewswire) — Walt Disney Records releases the original motion picture soundtrack for Solo: A Star Wars Story. The album features score composed and adapted by Academy® and Grammy®-Award nominated composer John Powell and the new Han Solo theme and original Star Wars music by five-time Academy Award-winning composer John Williams. Acclaimed composer John Powell marks his first-ever feature collaboration score with Lucasfilm for "Solo: A Star Wars Story." Recorded at Abbey Road Studios in London, the score features a 125-piece orchestra and choir conducted by Gavin Greenaway. Powell composed and produced the score including several new themes written by Powell including "Chewie Theme," "Love Theme," "Ensys Nest Theme," "Gang Theme" and "L3 Theme," as well as adapting the new Han Solo theme and some of the original Star Wars music by John Williams. Most recently, Powell scored "Ferdinand," as well as the "How to Train Your Dragon," "Bourne" and "Ice Age" films. "The Adventures of Han" theme was composed and conducted by John Williams. This new theme for Han Solo was recorded by the Recording Arts Orchestra of Los Angeles at the Newman Scoring Stage. Williams has written the complete scores for all eight of the Star Wars saga films, beginning with 1977's Star Wars: A New Hope for which he earned an Academy Award for Best Original Score. Most recently his score for Star Wars: The Last Jedi was nominated for an Oscar®. 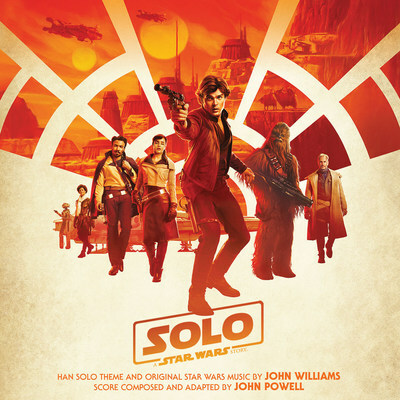 Describing his approach to the Solo: A Star Wars Story score, Powell says, "There is a language that John Williams uses in the Star Wars films, and I've tried to live up to the quality of what he has done before by keeping form and structure within the score and following the storytelling as honestly and elegantly as possible." He adds, "There is a lot of thematic material from the original movies that I used that are not specific to Han. They're specific to the Millennium Falcon, TIE fighters and the Empire. Those types of things are very useful as they're all part of the language we know. There are lots of other characters and ideas within the film that I wrote tunes and melodies (themes) for, so it's a mixture of new themes by me, a new theme by John Williams, and some of the old material." For more information on Solo: A Star Wars Story, please visit http://www.starwars.com/. For more information on Walt Disney Records' releases, like us on Facebook.com/disneymusic, follow us at Twitter.com/disneymusic and Instagram@disneymusic. For more information on Disney Music Emporium, please visit, DisneyMusicEmporium.com, become a fan at Facebook.com/disneymusicemporium or follow us at Twitter.com/DisneyMusicEmp.